After a strange warm spell, it seems to be fall around here for sure! Yesterday’s harvest weather was cool and cloudy and felt like a late fall day, without a doubt. The boxes are quintessentially fall-like as well. 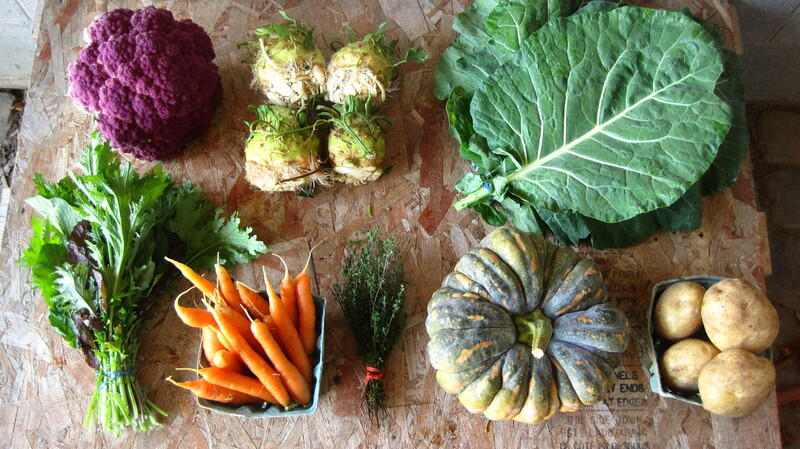 They’re loaded with great beautiful and nutritious veggies-lots of oranges, purples, and greens for good health. As the year is winding down we want to take another chance to thank all of our members, friends and family for their support this season! It’s been a long and at times very difficult one, but knowing we have you to work for and knowing we’ve had your support makes all the difference in the world. Thank you, members, we appreciate you! 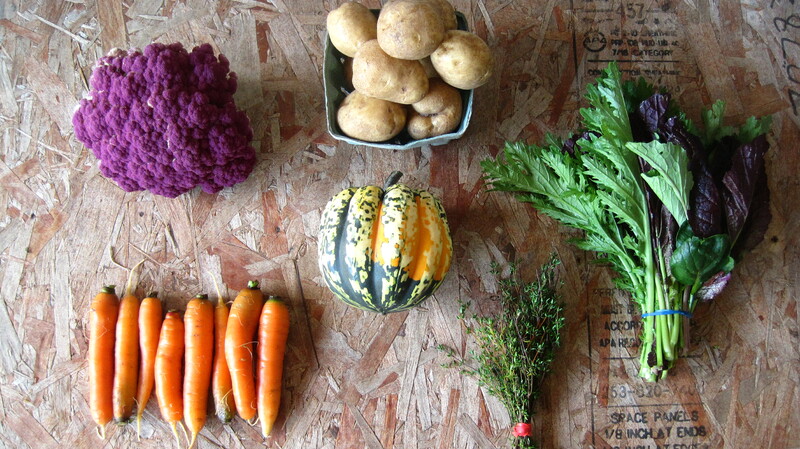 If you haven’t yet RSVP’d for the Member Harvest Party and Potluck, please do! If you’re on the fence and haven’t RSVP’d, go ahead and swing by. We’d love to see you, show you around the farm you’ve invested in for the season, and thank you in person. The party is Sunday October 5th. Harvest begins around 10 am, with the Potluck starting at 1:30. Feel free to come for just the potluck, just the harvest, some or all of the day. We’ve got a special treat this week of the freshest potatoes you’ll ever eat. We spent the day on Sunday digging a few thousand pounds of potatoes at Threshing Table Farm, owned and operated by our friends Mike and Jody Lenz. 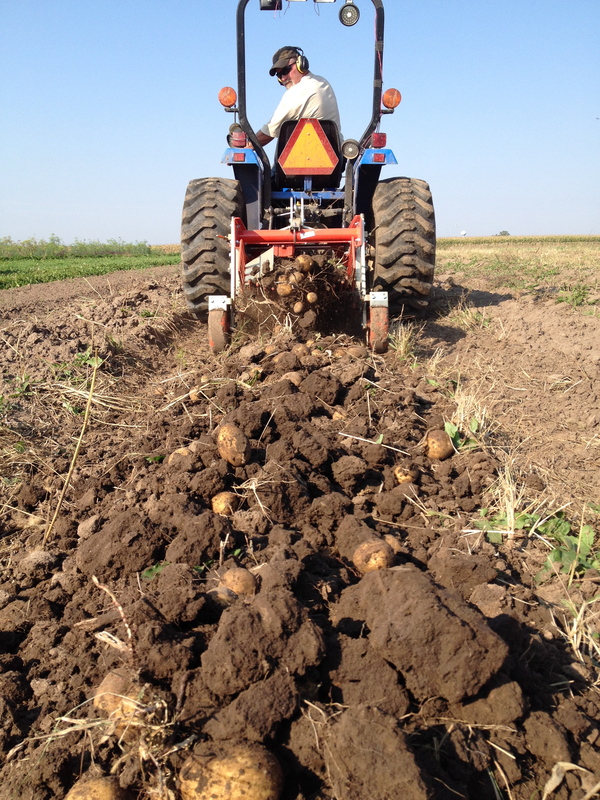 They are expert potato growers, and have great equipment for planting and harvesting, so it made good sense to us to have them grow our potatoes this year. 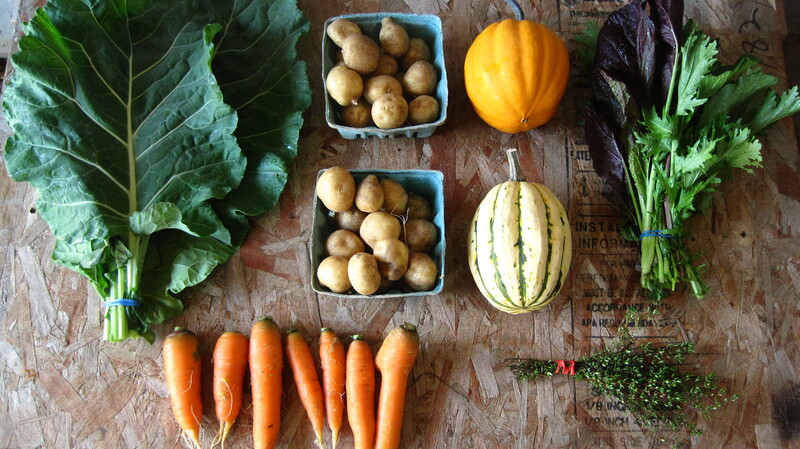 They turned out great, and we can’t wait for everyone to enjoy spuds that just came out of the ground! Mike driving his tractor with the super-awesome digger implement. It cuts underneath the potatoes, shakes them loose, and deposits them on top of the earth. SO MUCH BETTER than the hand-harvesting we did last year! 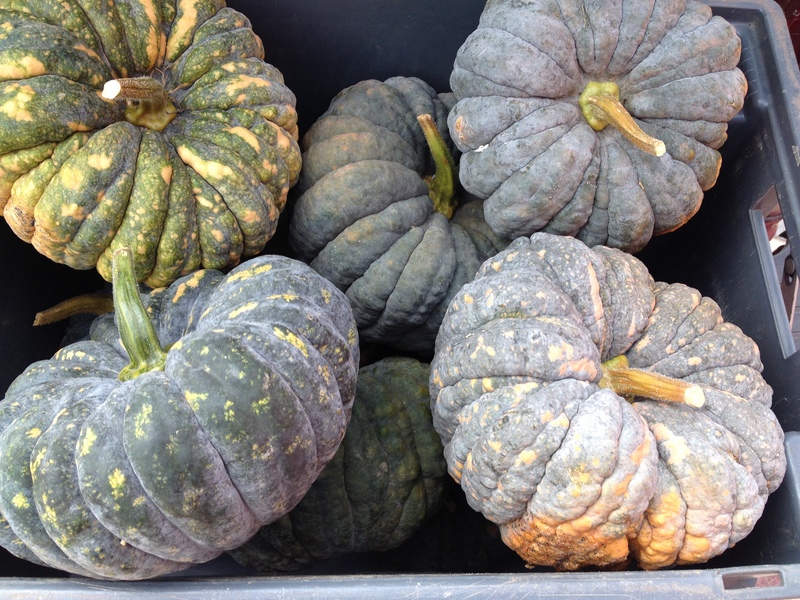 Squash-Small and medium shares will get a squash from the acorn family this week. Your beauties may include Jester, which is creamy with green in the grooves, Carnival which has awesome spots and freckles of green, orange, and black, or the odd bright orange one with green spots-a spontaneous hybrid that showed up this season. Full shares get to enjoy Chiriman, a neat Japanese heirloom. Chiriman has been around since the Edo period, (1603-1867 A.D.) and is an increasingly rare heirloom. Since we really like to keep the old, special, and at-risk varieties of fruits and vegetables going, we decided to grow this squash every year. The flesh is quite sweet, and it stores well in a cool, dry space. Potatoes-either Russet or Satina. Both varieties are delicious and can be enjoyed in all your favorite potato recipes. 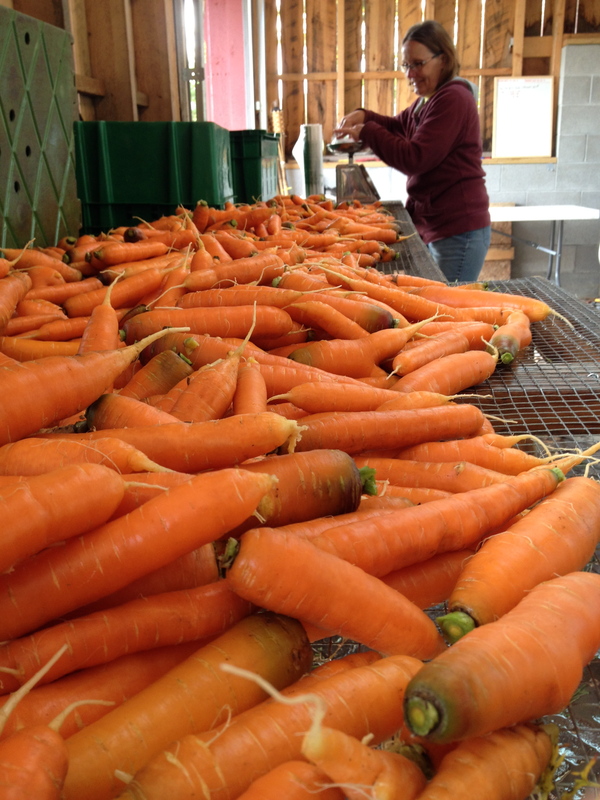 Carrots-as the carrots spend more time in the field, growing, the tops become less attractive and more tattered, so we decided to top them this week. Mustard Bunches-a tasty bunch of mixed mustard greens, full sized. Enjoy them in a stir fry, saute, or try this interesting, gluten-free and vegetarian Indian recipe from Food and Wine. Collards-These giant beauties are back! Collards are incredibly good for you, boasting tons of soluble fiber and lots of Vitamins C, K, and A. Store in a plastic bag in your crisper. Celeriac-Full shares get celeriac this week, and as the bulbs continue to size up all other shares will see them as well. 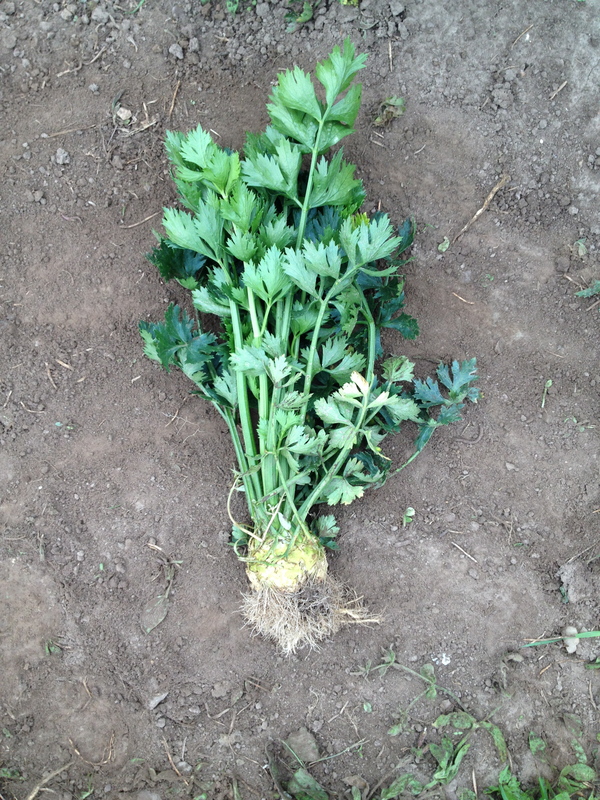 This ugly duckling of the veggie world has a lovely, sweet celery-parsley flavor. You’ll notice how rooty and knobby they are, so peel them and give them another good rinse before cooking. Definitely try them in last week’s root vegetable roast recipe. They should keep for several weeks in a bag in the fridge. Celeriac field. Note the leaves changing color in the background! Michelle with piles of carrots to sort and bag! Collard Greens with Bacon, a classic! 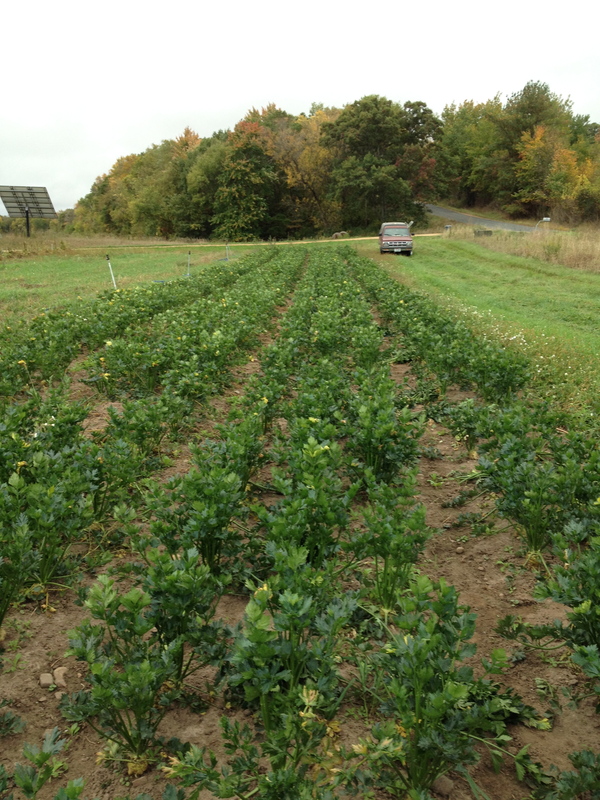 Working in batches, stack greens; cut crosswise into 2-inch-thick strips. Gather strips; cut crosswise into 2-inch pieces. Transfer to a large bowl of cold water; swish to remove grit. Transfer greens to a colander using a slotted spoon; let drain. Repeat until greens are free of grit. Heat oil in a very large skillet over medium-high heat. Add onion and bacon; cook until onions are translucent, about 4 minutes. Add greens; cook, stirring, until greens begin to wilt and are reduced in volume. Raise heat to high; add vinegar. Cook, scraping up brown bits from bottom of skillet, until vinegar has evaporated, about 1 minute. Add stock; reduce heat. Simmer, covered, until greens are just tender, 12 to 14 minutes. If making ahead, refrigerate, covered; reheat over low heat. Brandon, Heather, Baby Root (only 6 more weeks! ), Ben, Michelle and Frank!